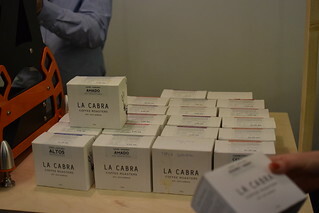 It was nice to see some representation from one of the Scandinavian roasters at London Coffee Festival with La Cabra travelling all the way from Aarhus, Denmark. 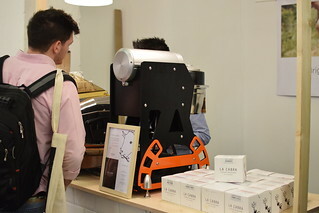 Here we met Ben from La Cabra who was eager and willing to talk to us about Scandinavian roasting philosophy and the coffees they had available on the stand. It turns out we’d just missed them doing a cupping, but fortunately they still had some filter left over from the batch brews. Starting with the Cerro Azul, a washed Geisha from Finca La Esperanza in Colombia, a coffee I’m becoming increasingly familiar with, Ben poured us each a cup. I’ve tried the natural more recently, but it had been a while since I’d tried the washed and it was nice to remind myself of the differences. This is a particularly transparent coffee with strong jasmine florals, while the natural leans more towards cherry flavours, it’s an elegant peach flavour in the washed, though the processing is pretty clean in both. 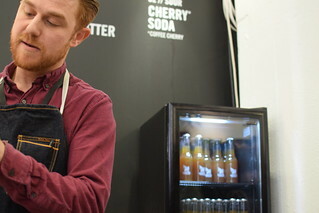 Ben went on to ask us if we were familiar with Scandinavian roasters, the likes of Koppi, Drop and Tim Wendleboe and their penchant for roasting pretty light. We had to admit we’d had pretty little from Drop and Koppi, but that we’d had chance to try a few of Tim Wendleboe’s coffees over the years and that we were going to Oslo on holiday later this year. We’d even been to Copenhagen a few years ago for a christmas trip to Tivoli, but had never ventured as far as Aardhus. In a change of pace Ben began asking us about how we brew at home. We talked him through our various brewing equipment and our regular brewing methods and it was clear to him that we had more than a passing fascination with coffee, that was up until he asked the question of water, where we had to admit that while we used a Brita filter sometimes, often it was water straight from the tap. Having just been at Colonna coffee I suppose I should have heeded the literary cries of Water For Coffee already. Having appreciated that we knew what to do with the coffee, Ben wanted to impress upon us the importance of the ingredient that makes up more than 90% of a cup of coffee, the water, encouraging us to look at buying a BWT magnesium plus filter to improve the quality of the water we were using to brew. Getting out my little notebook to write this down, Ben remarked ‘oh, you must be a coffee geek’ with my little notepad in hand. Luckily for my coffee, I’ve since heeded Ben’s advice and have a BWT filter currently shipping its way through the post to me as I write this. 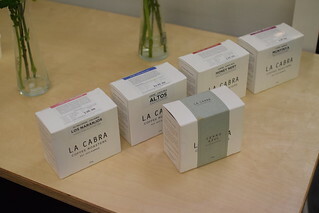 So if you’re ever in need of coffee brewing or equipment advice, feel free to send your questions to La Cabra through their contact page and they’ll be more than willing to help you. 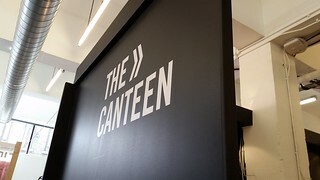 It was difficult to make it round London Coffee Festival without numerous people recommending you make it down to Square Mile’s Coffee Canteen. 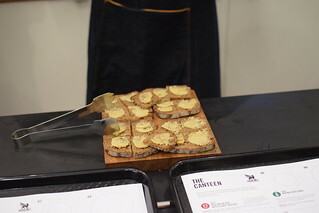 The recommendations were all for something different, some were excited about the bread, others about the butter and some about the soda, it seemed as if there was more than one reason to get excited about this experience and that was probably why there was a constant large queue to enter the canteen. 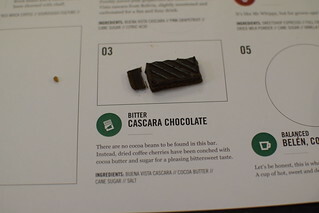 I’ll be honest as a coffee and chocolate fan I was pretty excited about the cascara chocolate. 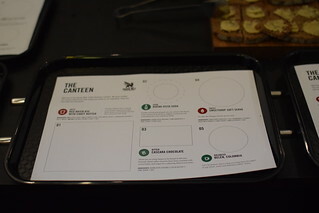 Here we met Pete Garcia to take us through The Canteen menu, where the focus was on finding usages and recipes for some of the products that are considered waste in the coffee industry. In the production of coffee the cherry that surrounds the coffee seed is often wasted and discarded, but in recent years some farmers have been taking care of their waste cherries and producing cascara, a kind of coffee cherry tea. This is great for numerous reasons, not only does this create additional revenue for farmers, as they now have anadditional product to sell, but it also leads to less wastage. On top of that, we as consumers are offered new and exciting coffee products, such as cascara tea, coffee flour and the possibilities of a number of products, which you are about to see now. 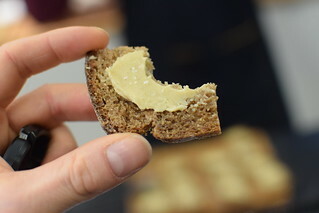 First up was a rye bread baked using some of Square Mile’s Red Brick Espresso by Pavilion Bakery, spread with a butter that incorporated the chaff from coffee roasting. Dark, salty and creamy it was thoroughly enjoyable. 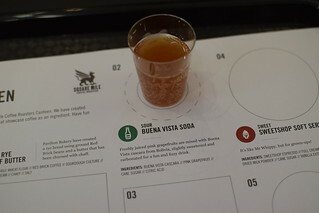 Following on, Pete poured out some ‘Cherry’ soda made from a Bolivian Buena Vista cascara and pink grapefruit, that was both sweet, sour and refreshing. A nice alternative to cold brew in the summer or as an alcoholic mixer. Next up was the one I’d been waiting for the cascara chocolate. James Hoffmann seems to have been taking more of an interest in chocolate of late and that interest has transferred to him playing around with chocolate and coffee recipes in what was described as his home workshop, having bought all the tools, it was time to see what his conching and refining skills were like. A mixture of Buena Vista cascara, cocoa butter, cane sugar and a little salt, this chocolate has no cocoa or cocoa mass, besides the butter and so, most of the flavour would be coming from the high percentage of cascara. To taste it hand strong, clear and individual flavours, I remember some distinct raisin notes, I was somewhat surprised at how good the flavours were and at their long length. If I had any recommendations for improvement it would be in the mouthfeel, while the melt was consistent and long the texture was a little on the pastey side. Still this was an exciting and innovative product. Apparently James and the Square Mile team are looking for a name for this new product, one that doesn’t involve a mash up of the words cascara and chocolate, my offering of cascacocoa didn’t cut it apparently. So if you have a talent for naming things, you can send your best suggestions to James on his contact form. For those more interested in the recipe it’s worth noting that James is going to be open sourcing this recipe and product, so for those of you with a home conch you might want to send him pictures of your best attempts to make cascara chocolate too. 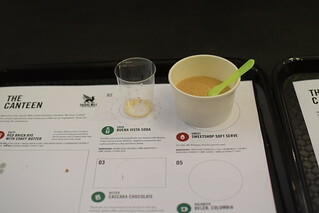 Next up was Sweetshop soft serve, an espresso based soft serve ice cream, which reminded me of my experiences with Moccia in Naples and their love of combining espresso with all things creamy and sugary. This was probably the least exciting of the recipes on offer for me, but in the warmth of the coffee festival I wasn’t complaining at some ice cream. This seems like a product best designed for serving alongside espresso in a tasting tray of sorts for coffee in the summer. You can recreate this part of the experience using Square Mile’s own recipe from their blog. Finally it wouldn’t be a coffee canteen without some coffee and so we were presented with Belén a washed caturra from Huila in Colombia. It was a little difficult going straight from cold to hot, but I took a sip before taking the coffee away with me. The Belén was designed to showcase balance and I could pick up some smooth plum flavours in the cup. We chatted a little to Pete about the experience before we left pondering recipes in our heads without any particular destination in mind. Even though we had essentially just eaten, we were feeling a little hungry and we’d had our eye on some Crosstown Doughnuts ever since we’d arrived. 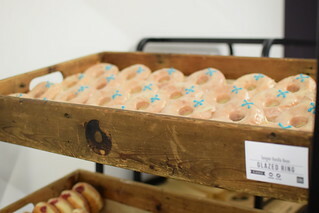 Now I only eat doughnuts when they’re really good, so it was a pleasure to go visit some of our favourite neighbours from last years London Coffee Festival. 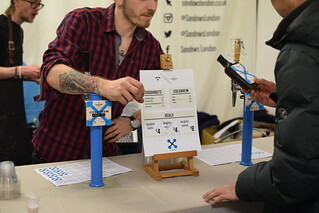 Having built up a relationship last year, this year looked more like a collaboration, with Crosstown producing a Sandows themed doughnut and a menu that offered both a doughnut and a bottle of cold brew for £4. Impossible to refuse at that price, we picked up a Sea Salt Caramel Banana doughnut, a Raspberry Jam doughnut and two bottles of Sandow’s Brazilian cold brew. Finding a space by a wall to sit on we tucked into our doughnuts, saving our cold brew to take home with us for drinking in the sun at a later time. 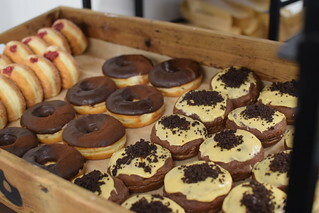 The doughnuts were delicious if you happened to be wondering. Feeling tired after an intense adventure round London Coffee Festival, I went back to Cocoa Runners to pick up my chocolate bars and chat a little about cascara chocolate, before we made our way downstairs to have a wander around Milk & Sugar. All credit to the organisers of the festival, considering they have ongoing competitions and over 30,000 visitors attending, to have so much coffee fun packed in all under one roof must take some serious organising and thanks have to go out to all the exhibitors for being on top form again this year, even as late in the day as Sunday. Until next year! 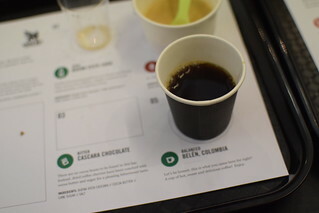 This entry was posted in coffee, Coffee Roasting, Coffee Tasting, London Coffee Festival, Uncategorized and tagged Cascara, Crosstown Doughnuts, La Cabra Coffee Roasters, London Coffee Festival, Sandows, Square Mile by commoditiesconnoisseur. Bookmark the permalink. Well I do like to try and get round as much as I can. Explains how tired I am at the end. Haha maybe I’ll have to speak to the press pass officer next year and see if they’re feeling kind. Given the thoroughness of your reports, and the fact that you’ve been doing it for wto years now, you should be a shoe-in for a press pass.